BIG NEWS from the Todalo Shakers!! Brand new CD, "Rock Away My Blues" and a Northern California tour! THANK YOU to all who contributed to the Kickstarter campaign for "Rock Away My Blues" - we reached our goal and will have CDs in time for our Todalo Shakers tour. Our CDs are always available from us at our shows, or order online from CDBaby, simply click here! Or, send us an email and buy from us direct! You can also get to the Thompsonia CDBaby site by clicking on the album cover image to the left. If you like what you hear, please consider writing a review on our CDBaby page. Pictured here is our most recent CD, with Thompsonia: "Nothing But Rain"
Eric and Suzy Thompson at the Old-Time Tiki Parlor DVD is now available, either from us at our gigs, or directly from the Old-Time Tiki Parlor itself. Here's the description off of the Old-Time Tiki Parlor website: "This powerhouse duo of traditional music powers through a hand-picked selection of Cajun, Blues and Old-Time songs and instrumentals. The raw power and virtuosity of their fiddle, guitar, voice and accordion work are all captured in this beautiful archival video. You’ll see and hear music from John Salyer, Dennis McGee, Mississippi Sheiks, Burl Hammons, Wade Fruge, Cheese Read, Melvin Wine, East Texas Serenaders and many more!" 18 selections. Click here to read Joel Savoy's extremely lovely blurb which appears on the inside of the package. for your listening and dancing pleasure! 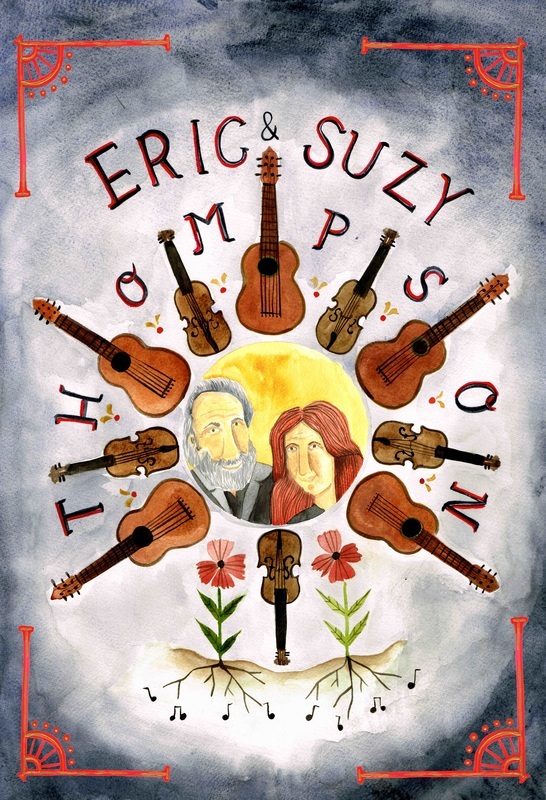 Eric & Suzy have devoted their lives to the pursuit of weird and obscure old-time American music – warped fiddle tunes in odd tunings, cinematic ballads, country blues songs that contain mysterious metaphors, early Cajun music with incomprehensible French lyrics and backwards chords. Using fiddle, mandolin, guitars, Cajun accordion, banjo (and the occasional odd instrument such as the ten-stringed cuatro) they bring these early 20th century sounds right into the present day. Eric's flatpicking on guitar and mandolin is exceptional for its purity of tone, speed, and soulfulness; Suzy is a powerful singer, an award-winning fiddler and Cajun accordion player who has apprenticed with older generation Louisiana Cajun musicians under an NEA Fellowship. Founding members of many influential roots music groups including the Black Mountain Boys, Any Old Time, the Klezmorim, and the California Cajun Orchestra, Eric and Suzy have also worked with Maria Muldaur, David Grisman, Peter Rowan, Jim Kweskin, Geoff Muldaur, Jerry Garcia, Darol Anger, Laurie Lewis, the Savoy Doucet Cajun Trio, and many other fine musicians. 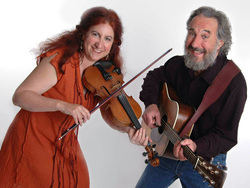 Eric and Suzy are available for concerts, festivals, music camps, parties, weddings, and nearly any other occasion upon which acoustic music might be desired, and they're also active as teachers, both in workshop settings and private lessons.